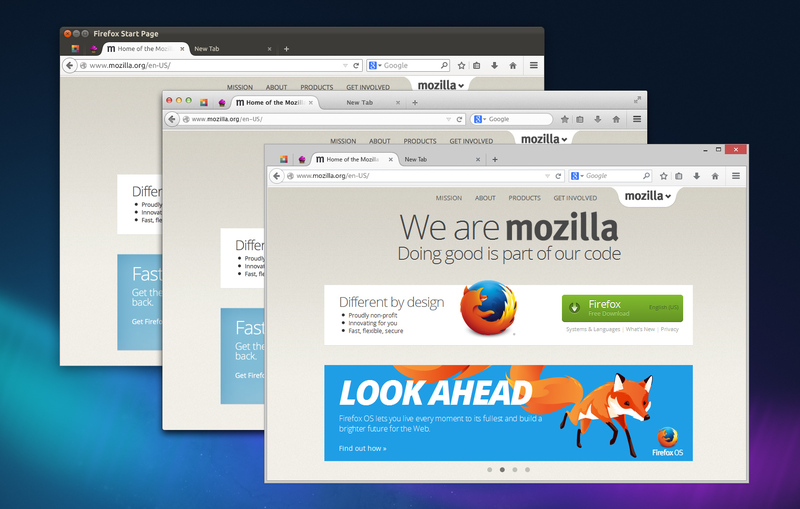 Mozilla today officially launched Firefox 29 for Windows, Mac, Linux, and Android. This is a massive release: Firefox Sync has been revamped and is now powered by Firefox Accounts, there’s a new customization mode, and the company’s major user interface overhaul Australis has finally arrived. Firefox 29 has been released over on Firefox.com and all existing users should be able to upgrade to it automatically. As always, the Android version is trickling out slowly on Google Play. Jonathan Nightingale, Mozilla’s Vice President of Firefox, told TNW that users found Sync really difficult to set up. Mozilla has also made it easier to discover, since many didn’t know it even existed, the VP admitted. Mozilla announced the new Accounts and Sync back in February. Firefox Accounts, which is part of Firefox OS as well, lets users keep track of their login credentials for various services, as well as their bookmarks, history, and any open tabs. Client side key stretching: a technique that protects against man-in-the-middle attacks, even when SSL credentials are compromised. End-to-end encryption: even if Mozilla’s servers are compromised, it is extremely difficult to access a user’s data. Public key cryptography and the BrowserID protocol: Separation between authentication, authorization, and data storage servers to minimize the number of servers that handle authentication material, and thus reducing our attack surface. Below are the additions to Firefox depending on what device you’re using. Firefox 29 is primarily a major release for desktop. It comes with a new customization mode: just click the new Menu button and hit Customize. Customization is now “front and center” in Firefox: the second you exit customization mode, everything stays exactly where you put it. While the feature is very straightforward to use, Nightingale told TNW it “took the most engineering and design time” than any other feature. Last but certainly not least, is Australis. All the aforementioned customization is being done in what Mozilla calls “the most carefully designed browser interface on the planet.” Nightingale says “the look of the entire UI has changed” as the company has spent quite a lot of time making it “more beautiful” and making sure information is present in a cleaner way. The company says Firefox’s overall look and feel now focuses more on your Web content, particularly thanks to the new tab structure. Tabs have a “more fluid and streamlined shape,” are positioned higher up in the browser, and those that are not in use have been visually de-emphasized. As part of the redesign, there’s a new menu panel that includes all of your browser controls, features, and add-ons in one place. You can find familiar tools like copy/paste, print, full page, save, and so on, but there’s also a permanent section for Firefox add-ons, so this is where you can find them all after the download is complete. Nightingale told TNW the single menu not only makes using Firefox simpler, but it actually brings the browser closer to a mobile UI, which helps the team develop the app across platforms. Mozilla has also removed a few things from the main toolbar. The act of bookmarking and management has been combined. The download manager now only shows up if you’ve downloaded a file recently. The same goes for the forward button: it only shows up if it might be needed, which is naturally much less frequently than the back button. 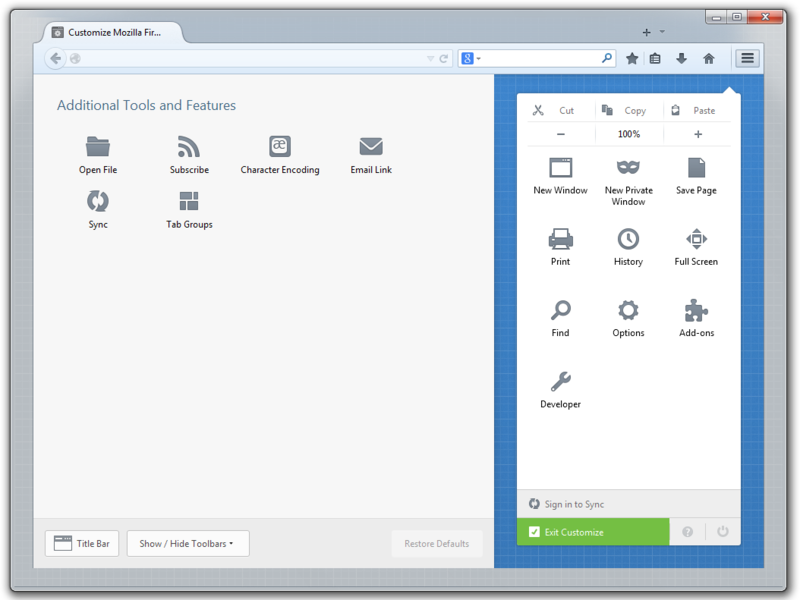 Mozilla was first planning to have Australis ready for Firefox 25, which arrived in October 2013. There were many delays, however, and it only hit the Nightly channel in November. This was followed by Firefox 29 beta in March and now in April, the final release has gotten the redesign. Actually, since the beta, Nightingale says Mozilla has made two important changes in response to user feedback (especially from Mac users) that dragging the Firefox window was quite hard (you’d always end up selecting a tab). The company added “a pixel or two” of extra click space as well as a checkbox in customization mode to turn on a full title bar (which also includes the full title of the webpage). New: Significant new customization mode makes it easy to personalize your Web experience to access the features you use the most (learn more). New: A new, easy to access menu sits in the right hand corner of Firefox and includes popular browser controls. New: Sleek new tabs provide an overall smoother look and fade into the background when not active. New: An interactive onboarding tour to guide users through the new Firefox changes. 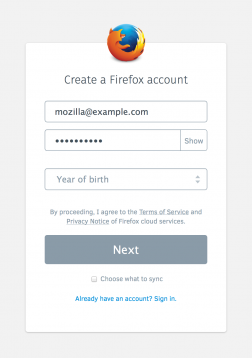 New: The ability to set up Firefox Sync by creating a Firefox account (learn more). New: Gamepad API finalized and enabled (learn more). New: Malay [ma] locale added. Changed: Clicking on a W3C Web Notification will switch to the originating tab. Developer: ‘box-sizing’ (dropping the -moz- prefix) implemented (learn more). Developer: Console object available in Web Workers (learn more). Developer: Promises enabled by default (learn more). Developer: SharedWorker enabled by default. Developer: input type=”number” implemented and enabled. Developer: input type=”color” implemented and enabled. Developer: Enabled ECMAScript Internationalization API. Developer: Add-on bar has been removed, content moved to navigation bar. If you’re a Web developer, you should probably check out Firefox 29 for developers. While the new customization mode and Australis don’t impact Firefox for Android, the aforementioned Sync tool does. The new release does, however, let you customize the swipeable History, Top Sites, Bookmarks, and Reading List menu of home screen pages as well as choose which one appears as your default. Your chosen home screen page now appears automatically when you open a new tab or start a new browsing session. You can also hide the pages you don’t use regularly or hide them all to get a clean new tab experience. Aside from that, there are some Bing improvements, new quick share buttons (icons appear on the menu bar for your two top sharing services including Facebook and Twitter), and a few more languages (now available in more than 30, with Mozilla promising new languages are “coming soon”). New: Search suggestions available via Bing search plugin when set as default search engine. New: Added multiple quick share buttons. New: Better integration for Open Web Apps. New: Set default home panel. Changed: Performance improved by replacing throbber with a progress bar. Developer: Synthetic APKs enabled by default. Developer: Color picker widget implemented, access by using input type=”color”. Fixed: Improved favicon.ico decoding (748100). Even after offering multiple pre-release builds, Mozilla will undoubtedly want to further clean up this release. 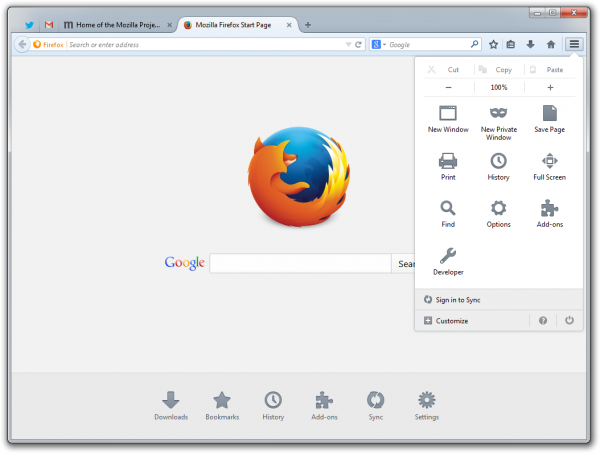 Firefox 30 is slated to launch in June.